This is a photograph of Cyrus Leland, Jr. with a group of people taken in Troy or Highland in Doniphan County. First row, left to right: Governor Willis J. Bailey; Cyrus Leland, Jr.; (possibly) Senator Long; 2nd row, left to right: unidentified woman; Judy Leland (Mrs. George P. Hayden), d. 1962, Long Beach California, George P. Hayden d. c1934; Mermie Castle; Fannie Leland (Mrs. G. C. Finley), d. c1959, Long Beach, California, G. C. Finley, d.1945; Eva Castle; the others are unknown. 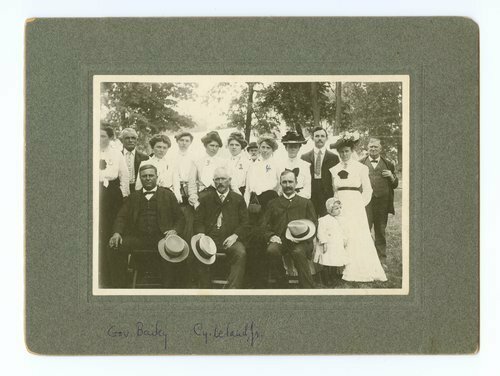 Cyrus Leland, Jr., (1841-1917), was born in Sauk County, Wisconsin and came to Kansas in 1858. He served as a lieutenant with Company F of the Tenth Kansas Infantry. He was a member of the Kansas Legislature in 1865-66 and again in 1903-1907. Beginning in 1866, he operated a store in Troy, Kansas, and served many years as a county commissioner and as a member of the Republican national committee. Appointed by President Benjamin Harrison to be collector of internal revenue for Kansas, Oklahoma and the Indian Territory, 1889-1893, Leland was named Missouri Valley pension agent by President William McKinley, a position he held from 1897 until 1901. He was a dominant force in Kansas politics and government, at both the state and national levels. He died in a St. Joseph, Missouri, hospital.